Sam Dawson believes his life is at a crossroads, and brook trout will show him the way. Fishing the icy mountain streams of southeastern Wyoming is interrupted when fate challenges his life once more. In this third Sam Dawson Mystery, the photographer and his daughter, Sidney, are on a hunt to find the truth behind what caused the death of an innocent little girl. Sam seeks to unravel the expanding mystery while exploring the boundaries of his complicated relationship with Annie George, his former girlfriend and now his publisher. From the unique backdrop of the beautiful and turbulent foothills of Wyoming's Laramie range to the expansive prairies of the Nebraska Sandhills, Sam untangles the web that links the past with the present. Strange happenings in the isolated ranch house that Annie rents from a reclusive rancher, as well as competition for Annie's attention from a handsome animal behaviorist, threaten to deter Sam's investigation. 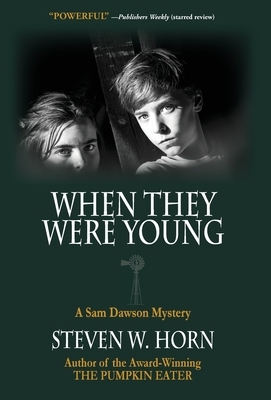 The author of the award-winning Sam Dawson Mystery novels, Steven W. Horn, continues his dramatic, intelligent, and gripping storytelling. In WHEN THEY WERE YOUNG, Horn presents a novel of insight and poignancy as he delves into the uncompromising complexity of relationships and their consequences that set in motion years of deception and revenge in this spine-tingling read.